Snow Bunting/Plectrophenax nivalis. India ink and acrylic on paper. 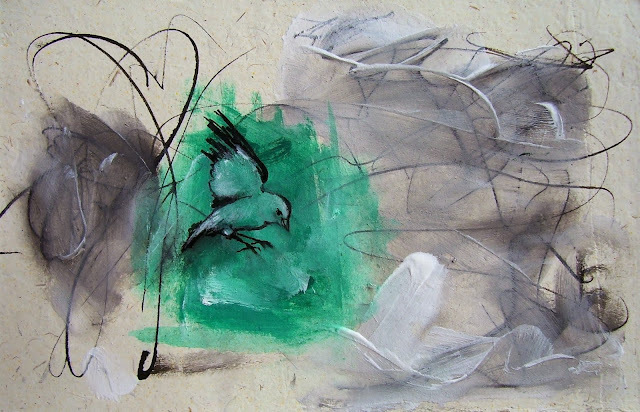 Birds are in my heart these days, flapping mightily into metaphor and song with the deepening of winter. The more I tune into them - and the more they flutter around inside me - the more astonishing/magical I find them. 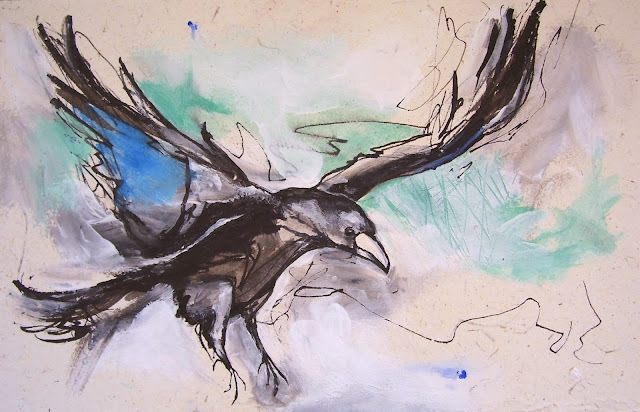 I've been watching raptors and juncos here in the canyon country of southern Utah, but also thinking about the birds of the far north and far south. And I've been painting them. Arctic Tern/Sterna paradisaea. India ink and acrylic on tree-free paper. Arctic Tern. Notorious for their epic migrations, these fleet birds breed in the Arctic and fly south every year to winter in Antarctica. That's an annual round trip of over 40,000 miles!! I filmed them off the coast of Greenland and slept on an island where they were nesting. They lay a clutch of eggs directly on the ground, and daddy bird helps incubate. Albatross, EXALTED!! India ink and acrylic on tree-free paper. Albatross. At home on the Southern Ocean as far south as Antarctica, they've made headlines in recent years for turning up dead, en masse, their stomachs filled with the ubiquitous plastic waste that fills our seas. Nineteen of the 21 species of Albatross are endangered. More inspired details: they can live for over 60 years, have the largest wingspan of any bird (up to 12 feet!) and can soar for hours - even days - without having to land. Good news: A banded Laysan Albatross of Midway Island in the North Pacific became a mom again at age 62!! 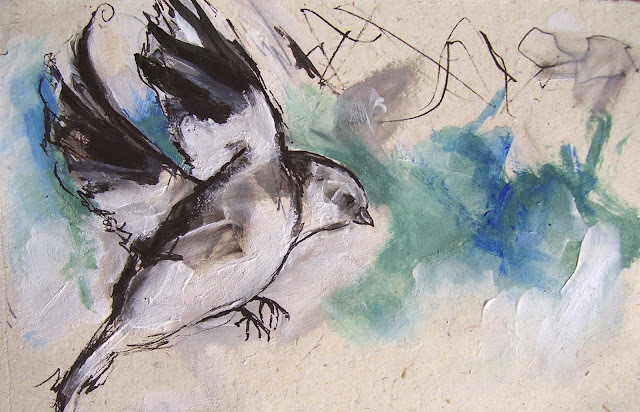 Snow Bunting, India ink and acrylic on tree-free paper. Snow Bunting. Possibly the cutest of tiny Arctic songbirds, they are also known colloquially as "Snowflakes". (And of course a group of them is called a drift.) They brave a non-stop, 500 mile flight from mainland Europe to get to their high Arctic breeding grounds on the Svalbard archipelago. Their voices were some of the first I heard when I arrived in Greenland. Raven, Canyonlands National Park. India ink and acrylic on tree-free paper. Raven. I didn't see ravens while in Greenland, although this is actually part of their range. Famously adaptable, intelligent and endearingly inquisitive! Their cries fill the still desert air here in winter. They can be aggressive, but I've also watched them nuzzling and grooming each other in the ragged sunshine of December. Iconic emblem of the Southwest, and perhaps the reason I'm now at work on a much larger commission featuring corvus corax. 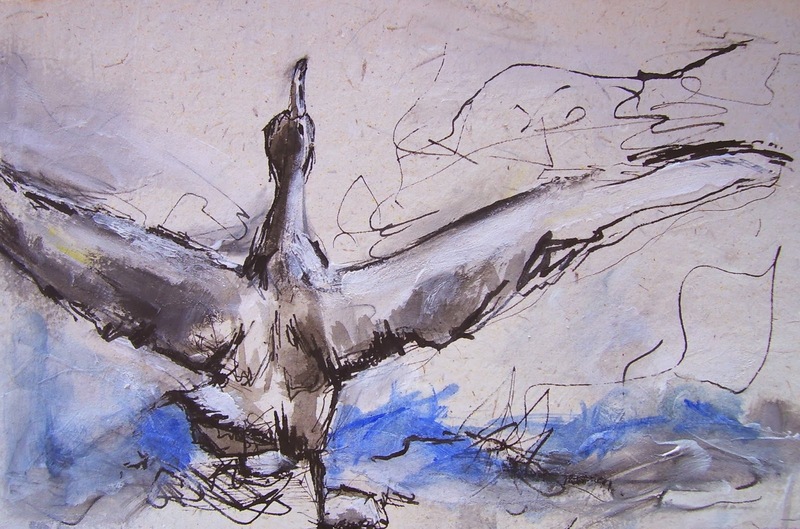 The small miracle of flight: mesmerizing, poetic. How fragile we are, these birds/we humans - and how resilient. The struggle to survive and thrive is universal. Arctic Tern, India ink and acrylic on tree-free paper. "Descension. Ascension. The velocity of wings creates the whisper to awaken," writes Terry Tempest Williams. "Once upon a time, when women were birds, there was the simple understanding that to sing at dawn and to to sing at dusk was to heal the world through joy." I am a woman with wings. All works by Rebecca Barfoot.